A few months ago when I was feeling particularly hopeless about the two-state solution, I joined an Israeli-Palestinian women’s dialogue group sponsored by the Israel/Palestine Center for Research and Information. The purpose of the first meeting was to determine the group’s focus. After talking for two hours with the help of translators, the group decided to focus on cooking. One Palestinian woman invited all twenty women to her home in Tarkumia for a hafla. How could cooking and eating together end the Occupation? I stayed home. 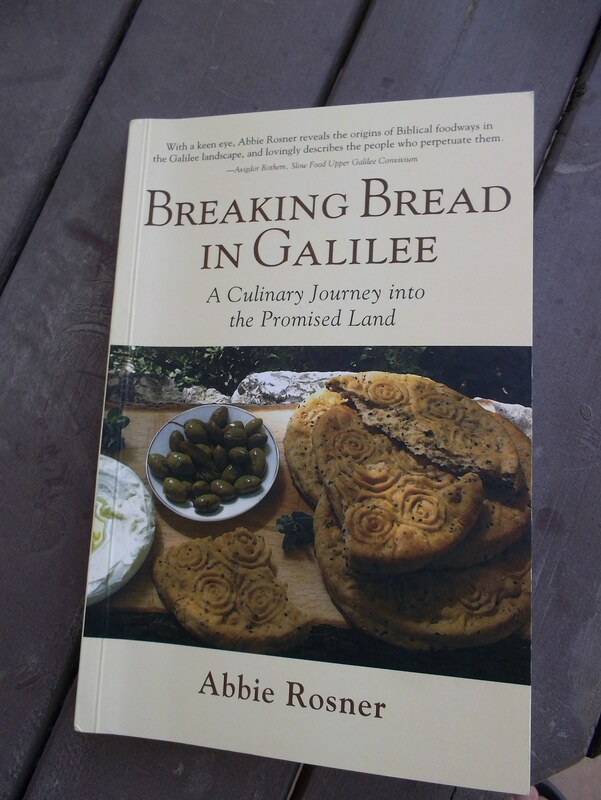 Last week I read an inspiring culinary memoir by Abbie Rosner, Breaking Bread in Galilee: A Culinary Journey into the Promised Land. For the past twenty-five years, Rosner, an American Jewish woman from Washington DC, has lived in Alonei Abba, a moshav in lower Galilee. In her book, she shares with the reader her meetings with neighboring Bedouin and fellaheen men and women. Over the years, these special people have taught Rosner about their traditional agriculture and food preparation, which is to say they have taught her about her culinary heritage, for most of these methods and foods are mentioned in the Hebrew Bible, Mishna and Talmud. In fact, just as Arabic place names have preserved the biblical Hebrew names of many places in Israel, so too has the local population living on and from the land for centuries maintained farming methods that date back to biblical times. Reading Breaking Bread in Galilee made me regret not having gone to break bread in Tarkumia and, a month later, not having attended the pre-Shabbat cooking gathering at my friend Shoshana London Sappir’s home in Jerusalem. That group put out a Hebrew-Arabic cookbooklet called “Kitchen of Languages.” The group didn’t end the Occupation, but it demonstrated that the way to peace might be through the stomach. Abbie Rosner has learned the power of breaking bread with neighbors. I have invited Rosner to address the readers of WrieInIsrael about some of her research methods for Breaking Bread in Galilee. Enjoy! Israelis love to talk about food. While researching for my book Breaking Bread in Galilee: A Culinary Journey into the Promised Land, I found that initiating discussions about food magically opens the doors of conversation with total strangers. This experience was particularly powerful as I encountered cooks and farmers in Arab villages across the Galilee, with my interest in their traditional foodways extended as a calling card and olive branch. On winter walks in the hills surrounding my home, I asked Bedouin men and women about the edible wild plants they were foraging and they graciously explained the names of each plant, how they prepared them, their medicinal values, and even invited me to their homes to teach me how to cook them. I harvested green wheat with a sickle, shoulder-to-shoulder beside a family of Palestinian fellaheen, before roasting it to make farike, and helped harvest their summer tomatoes, okra, and fakus, grown baal, without any irrigation. A conversation with a smiling woman from Nazareth over a specially decorated bread developed into a life-transforming friendship. My research was also textual. I read the Hebrew Bible to understand the agricultural landscape against which its narrative takes place. The more I read and the further I investigated the remote agricultural villages of the Galilee, the more I saw how these two worlds overlapped. Through the local, indigenous foods of the Galilee and the people who are still preparing them in age-old ways, I discovered a vital connection to the anient history of this land. I also understood that, in the face of modern Western ways, many of these traditional culinary and agricultural practices in the Galilee are destined for extinction in our lifetime. Breaking Bread in Galilee started out as a book about the local foods of the Galilee, but over the course of the research and writing, it evolved into a much more personal story. The worlds that opened to me and the relationships I developed compelled me to shift my writer’s voice from the third to the first person. This entry was posted in Israel, Uncategorized and tagged Breaking Bread in Galilee, culinary heritage, culinary memoir, edible wild plants, indigenous foods. Bookmark the permalink. “How could cooking and eating together end the Occupation?” A good question. I’ll let you know when we figure it out. Meanwhile, there are some delicious meals to be had and cooking tips to be learned. Here’s one from the women of Tarkumia: when making tabouleh, run a chopped onion through the blender with lemon juice and pour it on your burgul. Maybe we should pour that onion and lemon juice on our leaders, not just the burgul. Nice, Judy. I’m going to buy the book. Wonderful. You, especially, will love it.